Measurements of the metal content of stars in the Milky Way's disk, using stars observed by the SEGUE-2 survey. The bottom panel shows the decrease in metal content as the distance from the galactic center increases for stars near the plane of the Milky Way disk. The metal content for stars far above the plane, shown in the upper panel, is nearly constant at all distances from the galactic center. AUSTIN, Texas — Scientists are performing a census of the stars in the Milky Way in an effort to piece together the history of how our galaxy formed. Researchers working on the Sloan Extension for Galactic Understanding and Exploration 2 (SEGUE-2) project, part of the Sloan Digital Sky Survey III, have now observed more than 118,000 ancient stars that were born back when our galaxy was a fraction of its present age. "By studying these stars, we can learn what our galaxy was like when it was young, and how it grew and evolved," said Constance Rockosi, University of California, Santa Cruz astronomer and principal investigator of the SEGUE-2 project, during a presentation here on Monday (Jan. 9) at the 219th meeting of the American Astronomical Society. "We put those together to try to tell the story of how the galaxy was born, and how it grew to be the way it is today," Rockosi said. When the Milky Way's first stars formed, they condensed out of clouds of hydrogen and helium. Inside these stars, hydrogen and helium merged together to form the first heavy elements like carbon, nitrogen and oxygen. It was only when the most massive of these stars died in supernova explosions that some of the heavier metal elements formed and dispersed into surrounding space. As subsequent generations of stars were born from this material, they contained higher concentrations of these heavy metals. Thus, by studying stars' metal content (called metallicity), astronomers can tell how many generations of stars came before them. 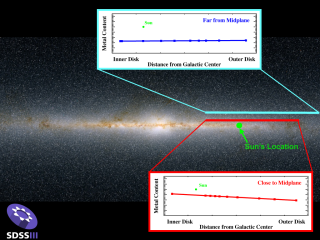 The SEGUE-2 researchers used their metallicity findings to probe the history of a particular part of the Milky Way, called its disk. This is the relatively flat, pancake-shaped part of a spiral galaxy that contains its spiral arms. Many of the disk stars are restricted to a dense thin disk, though some stars stray above or below the plane in what's called the thick disk. "The question we'd like to answer is, how did the thick disk form?" said Judy Cheng, University of California, Santa Cruz astronomer. To address that question, the scientists measured how the disk stars' metallicities changed with their distances from the center of the galaxy. They found that in the thick disk, distance had no effect on metal content, but for stars in the thin disk, there was a gradient, with those in the inside of the galaxy containing more metal elements than those on the outside. "This tells us the thin disk formed inside-out," Cheng said. The inside of the thin disk must have formed first, she explained, giving the center of the disk more time to accumulate metals from generation after generation of stars, while those in the newer, younger outside region were relatively metal-poor. In contrast, the uniformity in metal content of the thick disk points to two possible formation scenarios for this part of our galaxy. One possibility is that the thick disk formed all at once, leaving the metals spread evenly throughout it. Another alternative is that the thick disk used to have a metallicity gradient, but over time, and through a dynamic event such as an interaction with a smaller galaxy, the stars in the thick disk got stirred up. "It either formed rapidly or it's been mixed very well," Cheng said.